Who will seize the throne? Declare your allegiance! The war has begun between the Queen of Fire and the King of Ice, battling it out with their trusty sidekicks to see who will reign their supreme upon this legendary world! Will the spark of the Queen and her dragon lure you in, or will you side with the glaze of the noble king and his wolf? You will instantly bend the knee to whose reputation precedes it! The battle to the throne has begun in Dragon Wolf! 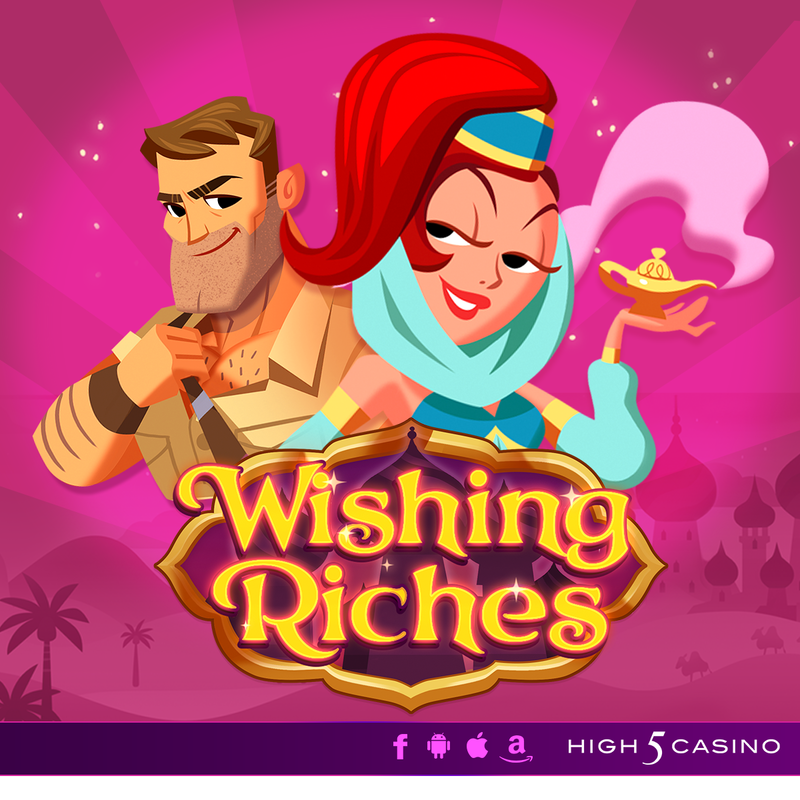 You’ll be dreaming of riches when you play High 5 Casino’s 293rd game! Set out to explore the desert island for otherworldly riches, this handsome explorer ended up finding something extraordinary instead! He rubbed the magic lamp without knowing it will summon the presence of a trapped genie hidden inside! Completely grateful for her rescuer, this genie breaks her “three wishes” rule and uses magic all the time! The genie inside the magic lamp is ready to grant Wishing Riches! Stacked Wilds and Scatter Bucks will conjure up spellbinding wins! Comment in the conversation bubble located on the top right corner of your screen and let us know what you think! Can you feel the powerful force around you? 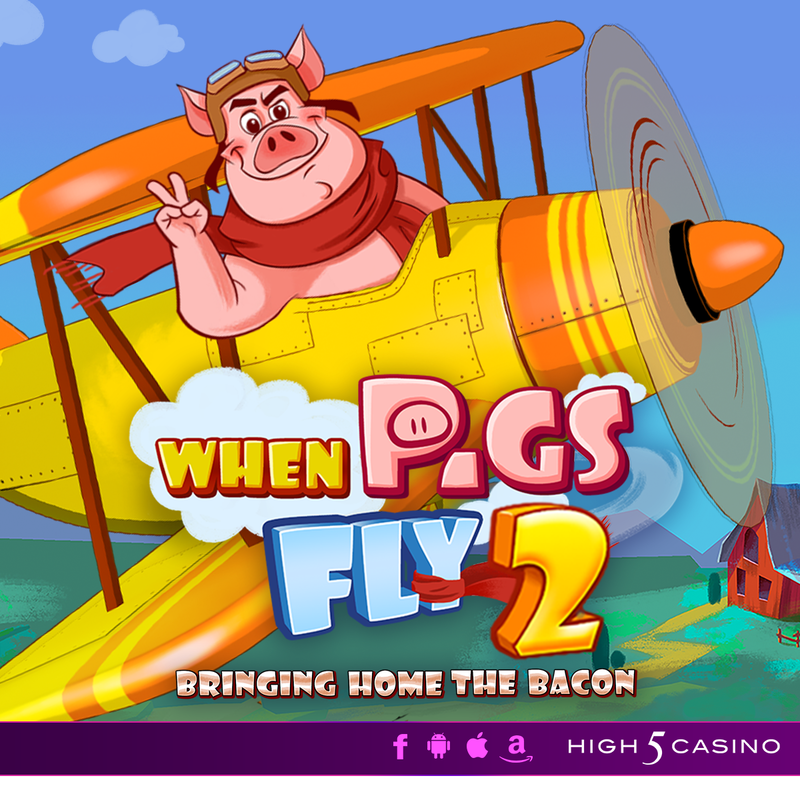 High 5 Casino’s 264th game is coming soon! Over five thousand years ago, a great evil appeared deep in space wanting to attack all planets that contained life. A unified army that made up the four classical elements known to be essential to our existence foiled this great evil. Each element’s rightful protector now observes and maintains the essence of life, waiting to stop the great evil when it returns. The protectors of nature will be called to the planets that have been threatened by this evil force of destruction. Combine the power of the four into a divine light, capable of defeating all evil in Forces of Nature! Are you ready to create a universal victory with Stacked Wilds and Scatter Bucks? Comment in the conversation bubble located on the top right corner of your screen and let us know what you think! Vote for good fortune in High 5 Casino’s 260th game! Take a trip to the nation’s capital for a patriotic good time. 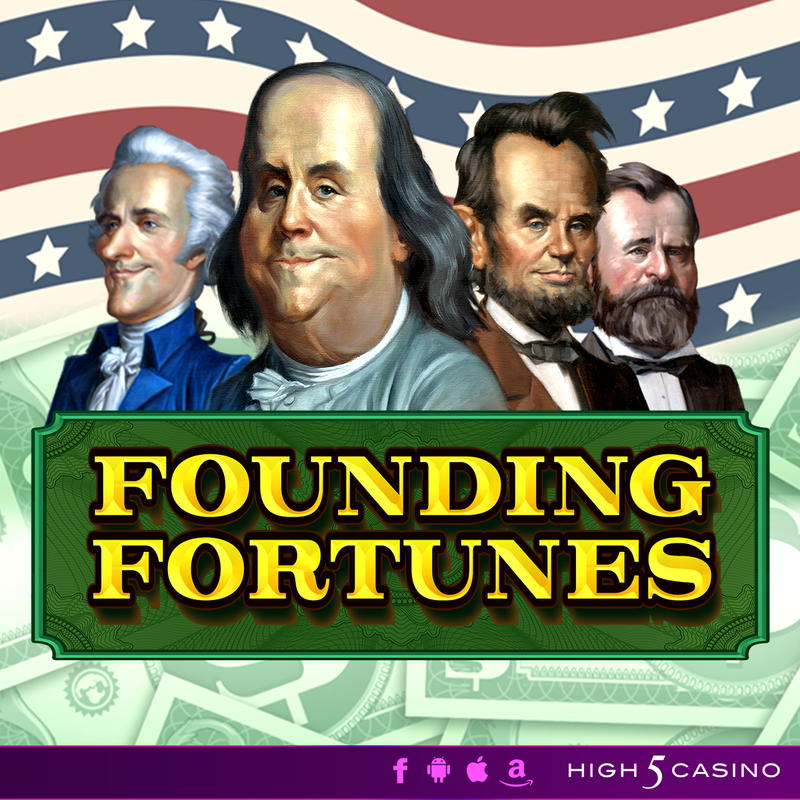 These famous presidents and founding fathers will lead you straight to the riches! Live the American dream with opportunities for more wins through Scatter Bucks and Jackpots. Are you ready for a patriotic good time in High 5 Casino’s seasonal summer game? Comment in the conversation bubble located on the top right corner of your screen and let us know what you think! 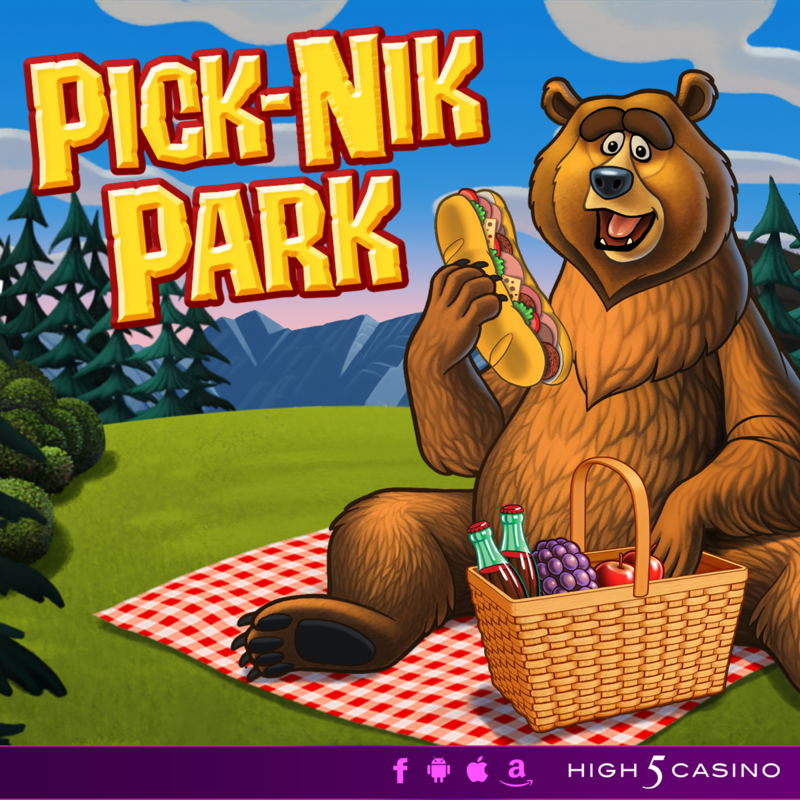 It is a perfect day for a delightful lunch at Pick-Nik Park! High 5 Casino’s 254th game is coming soon! The sprawling landscape filled with wild evergreen trees and jackpot buzzing bees will make for an afternoon of rewarding fun! Just be sure to keep a lookout for the ravenous bear and the hungry raccoon who enjoy snagging picnic baskets from the park’s visitors. The “don’t feed the bears” signs do not stop this friendly duo from getting their hands on a winning tasty treat. Enjoy a delectable bonus when they do not take your picnic basket! Is your appetite ready for a delightfully winning lunch with Stacked Wilds, Nudging Reels with Scatter Bucks, and Pick Bonus? Comment in the conversation bubble located on the top right corner of your screen and let us know what you think! Get ready to fight, conquer, and prosper. 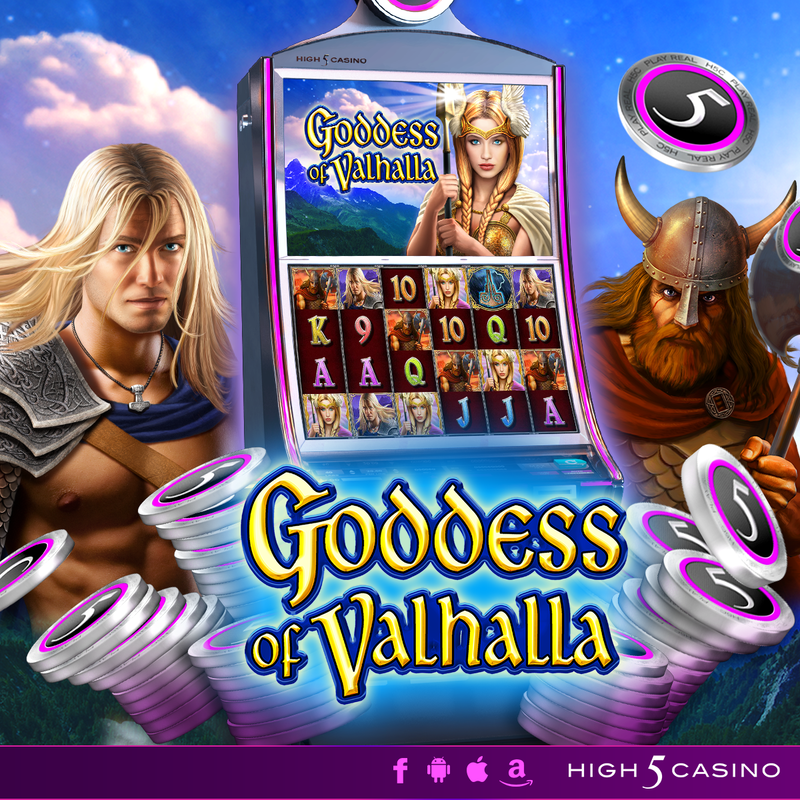 High 5 Casino’s 211th game, Goddess of Valhalla, arrives soon! Norse mythology comes to life in Goddess of Valhalla! High 5 Casino’s upcoming slot will take you to the mythological hall of the chosen dead, where you must fight to earn the favor of the goddess you desire. This is a legendary land of plenty, after all, so while you’re here, you’ll win big with Stacked Wilds and Scatter Bucks! Goddess of Valhalla. 4 by 6 reels. 10 and 50 paylines. Stacked Wilds and Scatter Bucks. Check out the YouTube video below and get ready to enter Valhalla! Are you ready to fight to earn the favor of the goddess? Comment in the conversation bubble located on the top right corner of your screen and let us know what you think! Game Preview: Secrets of the Pixies! 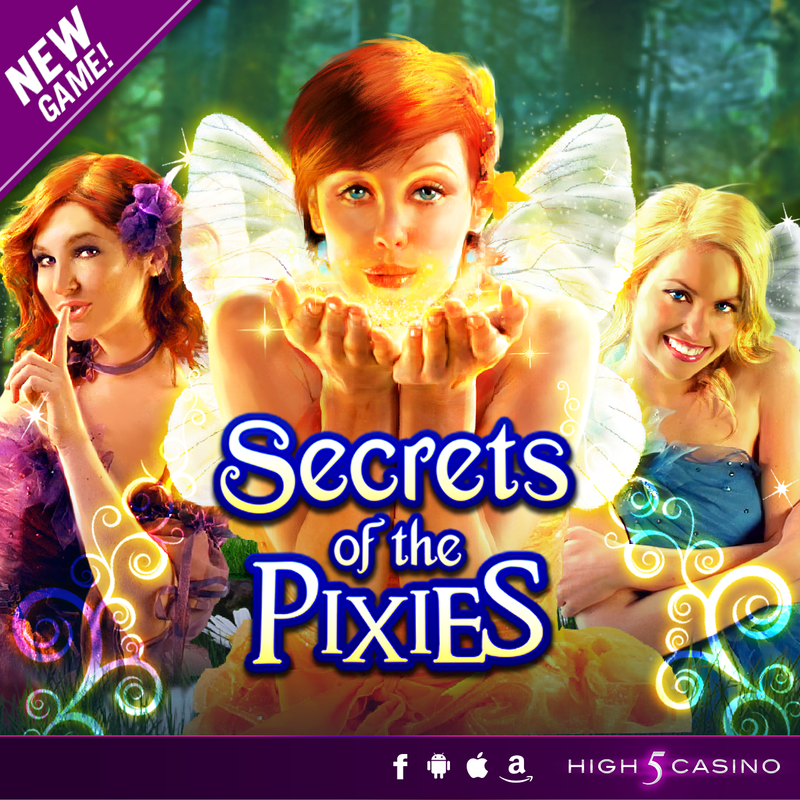 Be welcomed with mystical pixie dust in Secrets of the Pixies, High 5 Casino’s 189th Game arriving soon! Make your way to an enchanted forest where big wins are celebrated with the soothing vocals of pixies and fairylike gold acorns. You’ll be welcomed with a magical glitter-like powder from the pixies bringing you all the luck you need to spin the wins you desire. Follow the sounds of nature and mystical pixie dust wandering the reels for unimaginable wins in Secrets of the Pixies! 3 by 5 reels. 243 ways to win. Special Features: Tumbling Reels, Scatter Bucks, and Stacked Wilds. Check the YouTube video below and get ready to be enchanted by the pixies on your High 5 Casino Reels! Are you ready to Live the magic of the pixies? Comment in the conversation bubble located on the top right corner of your screen and let us know! Time really does fly when you’re having fun: this week marks the two-year anniversary of the launch of High 5 Casino! We here at High 5 Games can’t believe how much our app has grown in a mere 24 months. 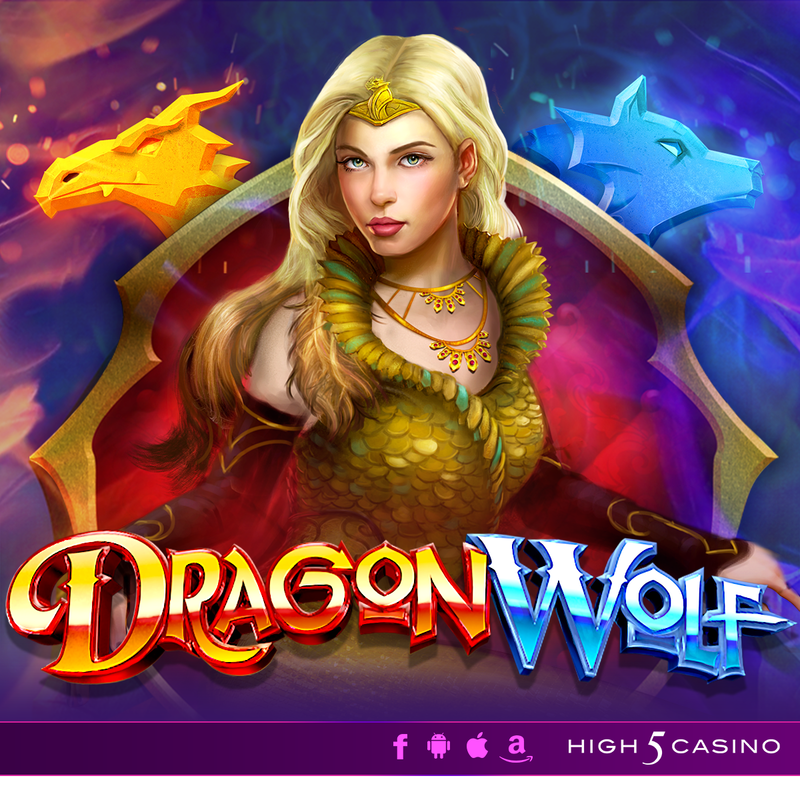 Since its September 2012 debut, H5C has grown to include 100+ premium slots, plus mobile versions and video poker; it’s also racked up nearly eight million downloads. None of this would have been possible without our loyal players, so a heartfelt thanks to each and every one of you! We hope you enjoyed the first two years, and we know the next two will be even better! 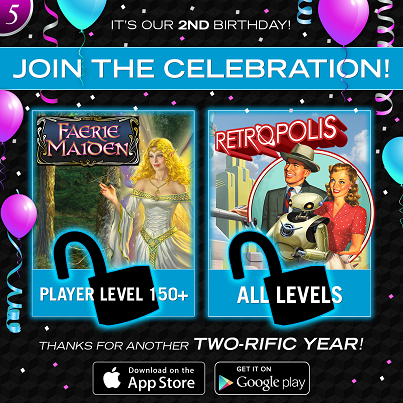 To celebrate High 5 Casino’s two-year anniversary, we’re releasing two amazing games today! The future is even wilder than you imagined in Retropolis, which is unlocked for all players! Fire up your jetpack or hop in a flying car and take a trip around Retropolis, a colony established on the moon in the year 2420. You’ll be amazed by the technological wonders you see and the robots you encounter. Who needs to return to Earth when Retropolis lets you score big wins with Stacked Wilds and Scatter Bucks? Faerie Maiden is unlocked for our Club 150 players and available to unlock for everyone else! He is a warrior prince, strong and brave and just. She is the Faerie Maiden, beautiful and kind and powerful. Although she normally avoids the affairs of mortals, she is drawn to him. One day, when he is alone, she can no longer conceal herself, or her feelings. He is shocked, but immediately smitten by her. 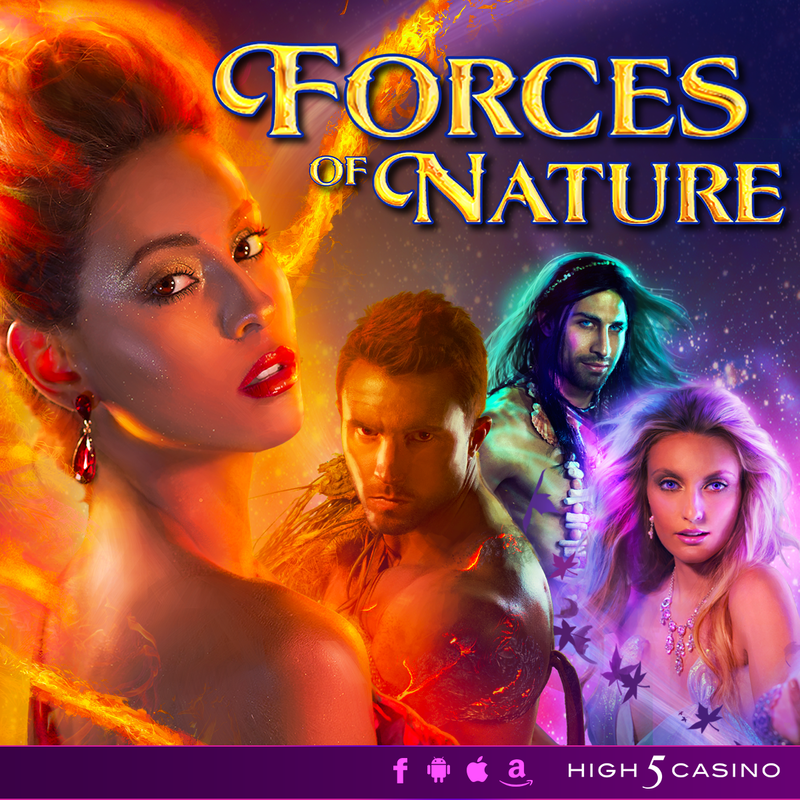 You’ll enjoy this tale of fantasy and romance while scoring major jackpots with Stacked Symbols and Free Games. What do you think of Retropolis and Faerie Maiden? What type of slots would you like to see High 5 Games make in the future? Celebrate our two-year anniversary with big wins at High 5 Casino. After having the same five favorite games in June and July, Shake the Sky Casino players made room in their spinning schedules for two new slots in August. 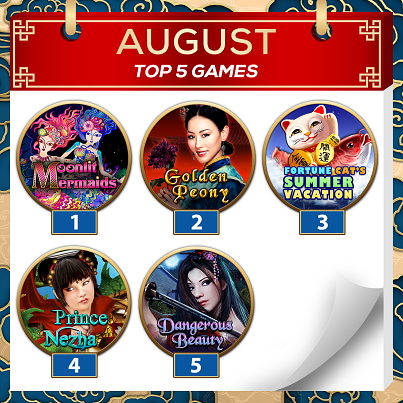 Moonlit Mermaids and Fortune Cat’s Summer Vacation joined Golden Peony, Prince Nezha, and Dangerous Beauty as the most popular games at Shake the Sky last month. It’s no surprise that those two games in particular stood out to players; Moonlit Mermaids pairs gorgeous art design in the traditional Asian paper-cut style with Scatter Bucks and Stacked Wilds, and Fortune Cat’s Summer Vacation combines a playful, exciting atmosphere with 1,024 ways to win and free games. What was your favorite game at STS last month? Become a statistic and play Shake the Sky Casino today!